The Pentagon is considering putting some of its mothballed frigates back into service. Military expert Vladimir Kozin told Sputnik Radio that currently the US Navy is facing a number of challenges. The command of the United States Navy is taking a “hard look” at bringing eight mothballed Oliver Hazard Perry frigates back into service, according to media reports. “We’re taking a hard look at the Oliver Hazard Perry-class frigates. There’s seven or eight of those that we could take a look at but those are some old ships and everything on these ships is old… a lot has changed since we last modernized those,” Chief of Naval Operations Adm. John Richardson was quoted as saying by USNI News. The measure is needed to reach the goal of having a 355-ship fleet.Another option in consideration to enlarge the size of the US naval force is extending the life of existing Arleigh Burke guided-missile destroyers. According to Richardson, this could help the Navy reach a total of 355 ships 10 to 15 years faster. “If we plan now, for instance, to extend the life Arleigh Burke DDGs beyond the current projections, the initial returns are we could buy ten to 15 years to the left in terms of reaching that 350 ship goal,” he said. 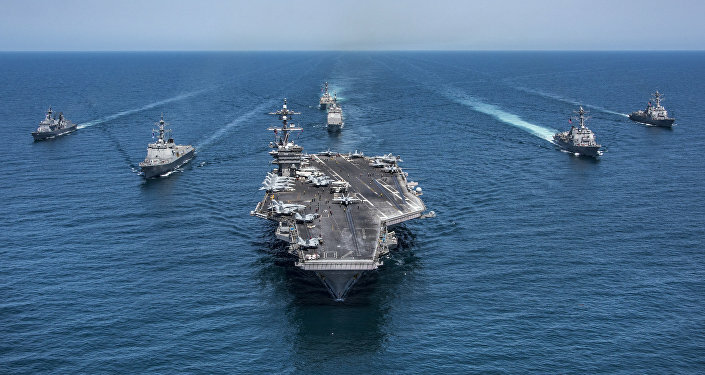 According to Vladimir Kozin, a military expert and professor at the Russian Academy of Military Sciences, only the return of mothballed warships into service would not resolve the challenges the US Navy is currently facing. “Those ageing frigates are not the solution. Even if they are back in service their use will be limited. There is a much more serious problem for [US President Donald] Trump, having a 355-ship fleet. The goal includes building 52 new frigates. Moreover, new aircraft carriers are needed, and they are very expensive. Plus, 12 new nuclear-powered submarines are planned to be built. Hence, a total of 80 new ships and submarines have to be ready by 2028,” Kozin told Radio Sputnik. He added that in addition to the construction of new vessels, the Pentagon would need more money on maintenance, ammunition, crews and repairs.”The Pentagon will need $180 billion in the next year budget. Where will they take the money? Moreover, the capacity of the ship-building industry is limited,” he said. Kozin noted that while implementing such an ambitious plan the US Navy has already faced a series of other difficulties. “Another reason why the Pentagon is considering putting mothballed ships back into service is the delay in construction of new frigates. It is yet to be decided where they will be built. The number of new frigates is also unknown. This is why for now they will be replaced with mothballed ships,” Kozin concluded.